Interstate Construction and Development worked with the Peterson Company for almost a year to provide budget costs for the demolition of the existing mall, related new facade construction, and a complete site work reconfiguration. The first contracted package was a 3-phase demolition of the existing mall and site area totalling approximately 1.1 million square feet. 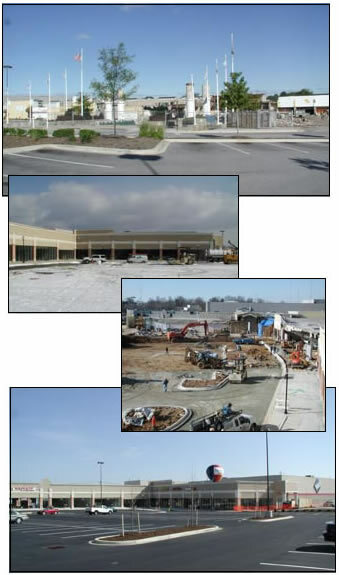 Once the first phase was completed, we were able to begin facade construction of the first seven storefronts. As phase two demolition neared completion, it was necessary to structurally shore up the existing corridor area, remove the existing slab and pour a new slab-on-grade. This allowed us to proceed with completing the new structural work, as well as the new storefront facade. During facade construction, the site package was also awarded to ICDC. New stormwater, sanitary, and water systems were installed, along with new concrete curb and gutter and asphalt work. All of this work was completed during the winter weather of December 2002 and January 2003.